Janet Roloff, managing attorney at the Legal Aid Services of Oklahoma’s McAlester office, represents a Fort Towson couple who couldn't afford a private attorney in a legal action to foreclosure on their mobile home. Attorney Janet Roloff pauses as she tries to estimate what it would cost David and Minnie Harris if she had billed them for the hours she’s worked representing them in their mobile-home foreclosure case. That is well beyond the reach of the Harrises, a Fort Towson couple whose only income is Social Security disability payments. Still, Roloff is unsure her pro bono work will pay off. After three years, a federal bankruptcy judge has yet to make a final decision on whether the Harrises where misled and defrauded in purchasing their mobile home in 2012 or, as lawyers for Vanderbilt Mortgage argue, they were just delinquent on making payments. But one thing Roloff knows: The Harrises and their three children would have lost their home years ago if it weren’t for the free legal assistance. “They would not have a chance,” Roloff said. Every month, thousands of Oklahomans show up in local courts on civil cases with no attorney representing them because they can’t afford the fees or aren’t aware that legal aid is available. Many more don’t even appear, figuring civil courts are for higher-income residents and there is little chance that their involvement will make a difference. The lack of civil representation is so severe that a study released in December declared the situation to be a crisis that is “shocking in its depth and breadth.” That study by the Lobeck Taylor Community Advocacy Clinic at the University of Tulsa, was done for a commission created by the Oklahoma Supreme Court in 2014 to address the problem. When it comes to the justice system and the poor or disenfranchised, people tend to think of criminal courts, in which a public defender must be appointed for the accused. In civil cases there is no such requirement. That means individuals can face life-changing consequences of court rulings without being represented by a lawyer, said David Riggs, a former state attorney general who chairs the Oklahoma Access to Justice Commission. Cases involving parties who have no attorney can vary widely, but often include domestic violence, in which a victim is seeking child custody, divorce or a restraining order; people who need help filing for bankruptcy, or those dealing with an unscrupulous boss, landlord or debt collector. Pittsburg County District Judge Jim Bland said in recent years he has seen a steady increase in people coming to court without a lawyer, or not showing up at all. “It just goes to show that there is absolutely the need for more legal aid services here,” Bland said. Legal Aid Services of Oklahoma is by no means a small organization. With an annual operating budget of more than $10 million, the nonprofit is able to afford a staff of nearly 150, including 63 full-time attorneys. Its funding comes from the federal government and private-sector sources. Last year, however, the organization reported that it was unable to provide legal representation for about half of the more than 16,000 Oklahomans who sought assistance and met the income eligibility requirements. “Because there is such a need, we have to make some tough decisions on who we can help,” Executive Director Michael Figgins said. There are 825,230 Oklahomans – or 21 percent of the state’s population – whose income or age qualifies them to receive legal aid, according to the Legal Services Corp., a federally funded nonprofit that distributes grants to state groups. That includes seniors and those who make at or below 125 percent of the federal poverty level, or $30,375 a year for a family of four. Figgins said there are tens or hundreds of thousands of other working poor residents whose income exceeds the maximum but who still can’t afford legal representation. According to the National Center for Access to Justice, Oklahoma has about one civil legal aid attorney for every 20,000 residents who earn less than 200 percent of the poverty level. That compares to almost 70 private lawyers for every 20,000 residents in the state. Figgins said his group’s funding in recent years has been stable, but demand has steadily risen as more people become eligible for assistance and become aware of their legal rights. Figgins and other legal advocates say one answer to the problem is more government help. Legal Aid Services of Oklahoma receives its funding through dozens of federal and private sources. But the largest source – comprising about 40 percent of their revenues – is grants from the Legal Services Corp. This year, Legal Services Corp. received $352 million from Congress – or $5.85 per financially eligible person – to distribute in field grants nationwide. That was less than the inflation-adjusted $383.4 million, or $7.54 per eligible person, it distributed in 2007. Legal Services Corp. is seeking $467 million, or 28 percent more, in field grants next fiscal year to bring its funding to pre-Great Recession levels. That would boost funding to Oklahoma’s two grantees, Legal Aid Services of Oklahoma and Oklahoma Indian Legal Services, up from $5.1 million to $6.8 million and allow both to take on more cases. Cindy Goble, the group’s statewide pro bono director, said an example of cases the organization must currently reject is when someone needs help with a divorce that does not involve domestic violence or custody of children. But even applicants turned away are offered some help, whether it’s a few minutes of legal advice or a letter outlining how to start the legal process on their own, Figgins said. Goble said more funding would also help with outreach efforts, such as a new program that embeds a lawyer at the YWCA’s domestic violence shelter. 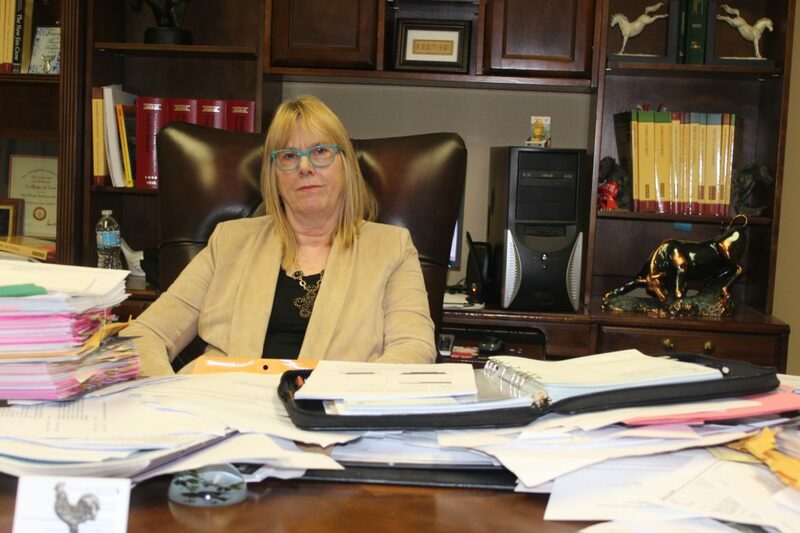 Roloff, the attorney in Legal Aid Services’ McAlester office, laments that every day she sees people she could help if she had more resources. In many such cases, Roloff said, the person being foreclosed upon won’t show up and the judge will grant a summary judgment for the lender or mortgage company – or, the person will appear without a lawyer and be out of their league. Compounding the problem is that Oklahoma has one of the least “user-friendly” court systems in the nation for self-represented litigants, scoring 10th lowest on a National Center for Access to Justice index this year. The state had the lowest ranking in accessibility for people with limited English proficiency. 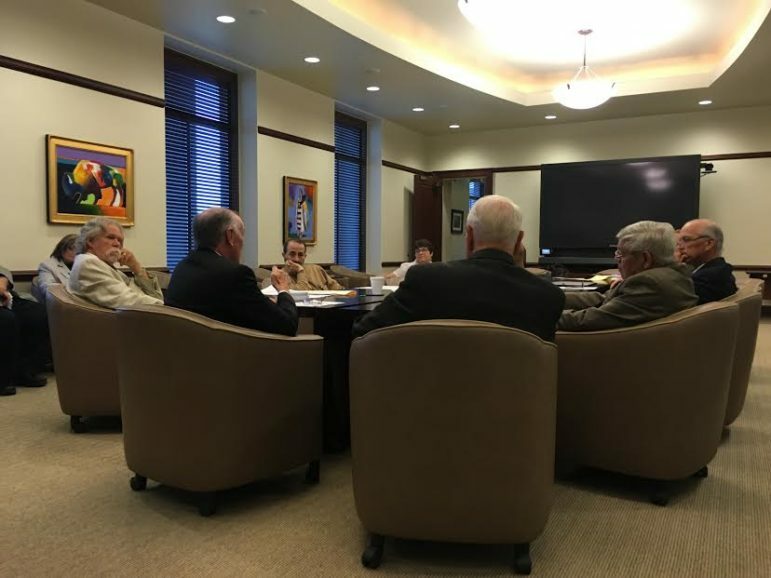 The Oklahoma Access to Justice Commission met Aug. 26 at the Oklahoma Judicial Center to discuss efforts to expand civil legal aid for Oklahomans. The 11-member panel was formed in 2014. The Oklahoma Supreme Court acknowledged the problem in issuing its 2014 court order forming the 11-member Oklahoma Access to Justice Commission. “Many low-income Oklahomans are unable to receive full representation on civil legal matters,” the court said. Riggs, the commission chair and an Oklahoma City attorney, said the panel has already taken some meaningful strides. Those include a statewide needs assessment that will be out this fall and a new website, developed with the Oklahoma Bar Association, that allows private attorneys to answer legal questions from low-income residents. During a recent meeting, commission members were advised that lawyers are not needed in certain cases. In their report, researchers at the Lobeck Taylor Community Advocacy Clinic recommended ways to make resources more available. Those included stationing lawyers at non-traditional places such as libraries and religious institutions, where they can offer advice and provide simplified, fill-in-the-blanks court forms. They also suggested a pilot program offering court-based, limited-scope representation for low-income residents. Instead of a lawyer handling the case from start to finish, he or she would handle drafting, pleading or legal guidance only at crucial stages. Riggs said he hopes many changes can be accomplished without legislation or increased state funding. But he said he remains pessimistic that all Oklahomans will gain full legal access anytime soon. Correction: The name of the Lobeck Taylor Community Advocacy Clinic was updated to reflect a recent change in the clinic’s title.